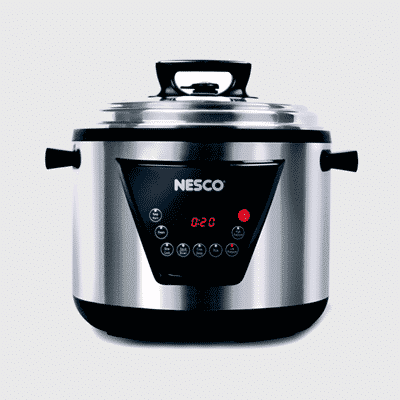 The NESCO® 6 Liter Pressure Cooker is sleek, safe and quiet. The NESCO® 6 Liter Pressure Cooker is equipped with several built-in safety features which will not allow the cooker to open while under pressure. The NESCO® 6 Liter Pressure Cooker is a sealed vessel, as the pressure inside increases, the boiling point of the water increases, which allows the liquid to rise to a higher temperature before boiling so the food cooks up to 70% quicker than traditional cooking. Even more impressive, the NESCO® 6 Liter Pressure Cooker is really four appliances in one: pressure cooker, steamer, slow cooker and rice cooker. Slow cooks food easily with the 12 hour timer, low heat (180º) to retain natural flavors and tenderness. The NESCO® 6 Liter Pressure Cooker also has a warm setting and browning setting. The warm setting can be manually used or will automatically switch to warm after using a High or Low setting. Functions are preset and programmable for up to an eight hour delay, so dinner’s ready when you get home. Self-locking lid and non-stick cooking insert are removable for easy clean-up. The tight lid is secure for transporting food to potlucks. Great for busy people!